This Mass takes place on the first Friday of every month except August and September. The devotion grew from the diary of St. Faustina. “Blessed are the merciful for they shall obtain mercy” Mt 5:7. 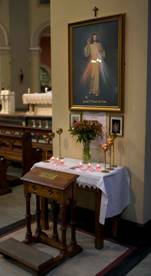 In our Parish the Divine mercy group meets to pray and celebrate the Eucharist at 7 pm on the first Friday of every month.